While Day 1B of the PokerStars Caribbean Adventure Main Event was gathering momentum, the $100,000 Super High Roller final table reconvened to play down to a winner. After a flurry of late-night action on Day 2, just five players returned to the live-streamed feature table out of a total field of 61. The largest portions of the $5,918,220 total prize pool were yet to be awarded. Taking the title and $1,775,460 first prize was Canadian Sam “Str8$$$Homey” Greenwood. Now third on the Canadian all-time money list, Greenwood has over $14.6 million in live tournament winnings. He has a WSOP bracelet, multiple SCOOP/WCOOP titles and high roller victories from the EPT, Partypoker Millions and ACOP and even a 6th place finish in this very event ($100,000 Super High Roller) from the 2015 PCA. He’s bested that PCA result here, however, having overcome expectedly tough opposition from some of the world's top high stakes players. On only the second hand of Day 3, a huge all-in confrontation between start-of-day chip leader Chris Hunichen (ace-king) and Greenwood (pocket aces) saw an abrupt reversal of fortune that propelled the Canadian into the chip lead, which he never relinquished. Greenwood doubled to 180 big blinds while Hunichen saw his stack relegated to the bottom of the counts. It was UK businessman and high stakes regular Talal “raidalot” Shakerchi, however, who bust first today in 5th place, moving all in with jack-nine only to find newly minted chip leader Greenwood with pocket queens. Hunichen described Shakerchi thus before the restart today: “He’s a legend – he’s on his fifth final table of the last six events he’s played – including the big $25k [PSPC]!” Shakerchi added $485,300 to the $509,000 he picked up in the PSPC – and his more than $6 million in prior live earnings. Hunichen – aka “Big Huni” online – never recovered from his early loss to Greenwood and busted in fourth place, all-in preflop vs. Henrik Hecklen with a dominated ace. One of the most prolific online tournament players of all time (he’s a former PocketFives #1), Hunichen has racked up over $11.7 million online and $3.8 million live, today adding $627,340 to the latter total. With an overwhelming heads up chip lead, it was not long until Hecklen’s tournament life was at risk. His final hand, ace-six vs. Greenwood’s pocket sevens, saw no help from the deck and Hecklen fell just short of back-to-back High Roller victories (he won the €10,000 EPT High Roller in Prague last month). 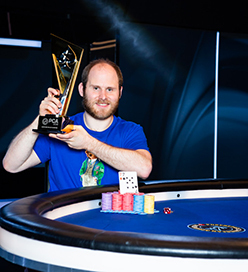 He collected $1,284,260 for the runner-up spot, while Greenwood became the PCA 2019 Super High Roller champion. This isn’t even Greenwood’s first $100,000 Super High Roller win at a PokerStars LIVE event – he won €1,520,000 in the EPT Monte Carlo version last year. As he self-deprecatingly noted, "Today was pretty easy, I just had the best hand a lot of times." Greenwood promptly hopped in the $50,000 Super High Roller. Revisit all the key action from the final table on the PokerStars Blog or watch watch the replay on PokerStars.tv.